C9 – FOR LOOKING AND FEELING BETTER IN JUST 9 DAYS! 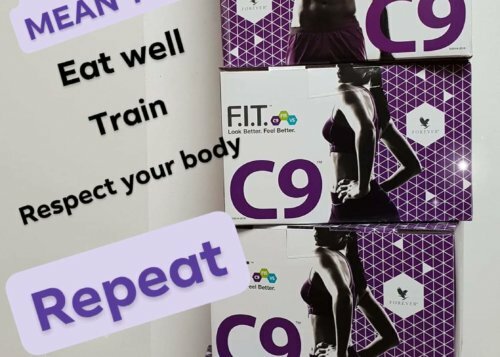 The C9 is a 9 day calorie controlled diet and exercise plan, helping you to take control of your body and lifestyle. It is designed to help you meet your weight loss, exercise and lifestyle goals. – Forever Aloe Vera Gel: a digestive aid. – Forever Fibre: designed for digestive health and is high in fibre and low in saturated fat. – Forever Therm: formulated with vitamins to provide supplemented support whilst achieving diet and lifestyle goals. – Forever Garcinia Plus: this is high in chromium which helps with healthy macronutrient metabolism and also contributes to the maintenance of normal blood glucose levels. – Forever Lite Ulta: is available in chocolate and vanilla and provides 24g of protein per serving, plus many other vitamins and minerals. This is my personal favourite product in the pack. It’s so yummy and I love experimenting with it with different fruits and vegetables. Cherry with the chocolate shake, ginger and cinnamon is my favourite so far. It’s YUM!!! It’s also really tasty with vanilla. It also comes with an easy to follow booklet with everything you need from recipes to exercises to a timetable of when to take what so you can’t get lost. I will also give you a consultation before you start to ensure you know exactly what you have to do. I provide support throughout the programme so you’ll never be alone. The RRP is £111.96 (exc delivery). However, if you can get four friends to join you and order from me by the end of the month then you can have yours for free! Get three friends together and I’ll give you a free product. So get calling and messaging all your friends. Who wouldn’t want to feel better and look better especially at this time of year?! There’s also a free PT session for those that do their C9 in January to help you on your fitness journey.